Cesena fell to a 3-1 defeat at the Stadio Manuzzi last night as Napoli capitalised on Yohan Benalouane’s with a much-improved second half performance. The Partenopei were good value for their win and thoroughly deserved their three points but things could’ve been so different if it weren’t for the red card. The first Serie A match to ever take place on artificial was a highly-entertaining affair with hosts Cesena matching their opponents during the first-half. Cesena should’ve taken the lead early-on when Comotto missed a free header with the ball dropping onto Benalouane’s head then wide of the goal. Napoli opened the scoring just a minute later when Lavezzi ran onto a long throw through a sleeping Cesena defence before stabbing the ball home from close range. Lavezzi on-target: El Pocho opened the scoring for Napoli. It was a poor goal to concede from Cesena’s point of view. The throw was taken quickly with the Seahorses’ backline standred high up the pitch. Credit to Napoli for recognising this and taking advantage, but to see such disorganisation from the home side’s backline was disappointing. Nevertheless, Cesena continued to push forward and continually asked questions of Napoli’s defence on the break. They moved forward quickly and purposefully, with the stadium’s new surface providing the perfect conduit for a high-tempo game. Particularly impressive was Antonio Candreva, whose strong, direct running helped Cesena break into the final third and won a few free-kicks along the way. Comotto rose well from a corner on the 22nd minute but, much like earlier in the game, the ball bounce wide of the post. Cesena would get the goal their play merited two minutes later, though, as the excellent Guana finished a move he’d started on the halfway line. Winning possession, Guana moved the ball on and made a lung-bursting run into the box, finishing deftly from Eder’s low cross. After equalising Cesena continued to look good going forward, but, like so many teams of their ilk, their defence looked increasingly suspect. At times it seemed like they were too focused on playing the ball out of the danger zone when a clearance would’ve sufficed. The Seahorses can consider themselves fortunate that Napoli didn’t have more of a cutting edge, as they sloppily conceded possession in dangerous positions far too often. Napoli were in ascendancy in the second-half, but Benalouane’s sending-off completely changed the course of the game. Penalised for a needless handball, the Tunisian received his marching orders as Marek Hamsik took to the pitch. Napoli started to dominate as Cesena struggled to get hold of the ball, and the home side conceded another sloppy goal on the 66th minute. A seemingly harmless Hamsik cross bobbled through two Cesena defenders and Hugo Campagnaro was at the back post to slide it come from point-blank range. An astonishing open-goal miss from Goran Pandev followed, before Hamsik smashed-in a vicious half-volley to make it 3-1. Cesena had a few late flourishes (particularly after the introduction of Jorge Martinez) but struggled to create any real chances after Benalouane’s sending-off. It’s difficult to tell how the game would’ve gone if the Tunisian had stayed on the pitch: Cesena definitely outplayed Napoli for periods in the first-half, but Napoli definitely looked the better side after the break (even before the red card). A disappointing result in the end, but Cesena certainly gave a good account of themselves. Their attacks were launched quickly and they passed like a team that had been playing together for years; impressive given the amount of players that have passed through the club this summer. What was most impressive about their performance, however, was the way they reacted to going 1-0 down. It would’ve been easy for them to capitulate after conceding such a disappointing goal, but they refused to compromise their style and kept their heads. In a buzzing Stadio Manuzzi Cesena defied the vocal away support and rallied superbly, as the quality of their equaliser testifies. 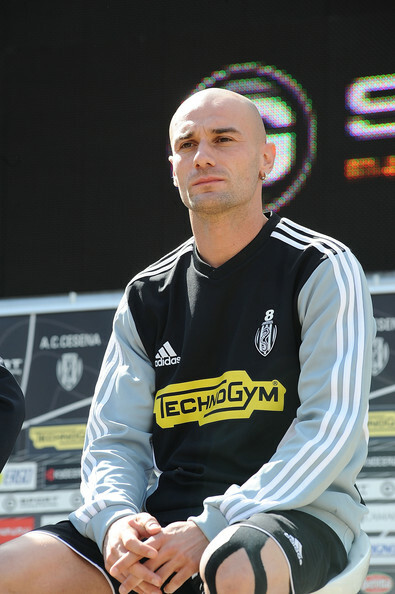 Ex-Palermo man Roberto Guana had a fine debut for Cesena. Sadly their defensive display was quite the opposite. The Seahorses looked disorganised and ramshackle at the back, and coach Marco Giampaolo will shake his head when looking back at Napoli’s first two goals. Defend against players as good as Hamsik and Lavezzi like Cesena did and you’re going to be punished. It’s that simple. This won’t be as big a problem against lesser sides, but if Cesena hope to improve on last season’s 15th place finish they’re going to have to tighten-up at the back. I’ve learned plenty about A.C. Cesena this weekend. This is an exciting, explosive side who can be thrilling to watch. Their attacking play is very pro-active, and teams will struggle to contain their slick passing and fast counter-attacks. Candreva looks right at home on the left wing, Mutu still has a touch of class about him, and Guana will be a vital physical presence in midfield if he can maintain this form. While they should score plenty of goals this season, Cesena will also concede a lot if they don’t improve their defensive organisation. The speed at which they reacted to Campagnaro’s long throw was embarassing, and they defended Napoli’s second goal like unsure amateurs. Perhaps the likes of Comotto just need time to settle, but the Seahorses have a lot of work to do to forge a cohesive defensive unit out of these players. Despite their defensive frailties, I stand-by my earlier assertion that Cesena can improve on last season. Relegation will always be a threat, but they have more quality going forward than a lot of Serie A teams and they have plenty of time to sort their defence out. It’s going to be an exciting season for the Seahorses, and I’m really looking forward to coming back to them after the turn of the year. Cesena fans have plenty of reasons to be optimistic ahead of the 2011-12 campaign. Tipped for relegation last year, the Seahorses managed a credible 15th-place finish after an impressive haul of 14 points from a possible 24 in the last two months of the season. In the end Cesena survived 2010-11 with games to spare, and an active summer transfer window should help them consolidate their position as a mid-table Serie A side. It’s been a busy summer at the Stadio Dino Manuzzi with 11 players leaving and no fewer than 14 arriving. On the departures front, Davide Santon and Fabio Caserta left after productive loan spells and forward Emanuele Giaccherini has been sold to Juventus. Ghanian midfielder Stephan Appiah’s contract wasn’t renewed and he has left the club on a free transfer, but perhaps the most significant departure is that of Luis Jiminéz. The Chilean midfielder rebuilt his career at Cesena last season after disappointing spells with Inter, West Ham United and Parma. Cesena’s key playmaker last season, Jiminéz also notched 9 goals in 31 league appearances for the Seahorses, but will feature for Dubai’s Al-Ahli next season after the resolution of a complex contractual issue with Lega Pro side Ternana. Cesena have had a productive summer in terms of new arrivals despite the losses of Jiminéz and co. Gianluca Comotto, Marco Rossi and Guillermo Rodriguez have arrived to shore-up the Seahorses’ defence, while Antonio Candreva and former Palermo man Roberto Guana should both start in midfield. Brazilian Éder is a striker whose talent belies his paltry six-goal haul for Brescia last season, and Cesena have also made one of the most intriguing buys of the summer in their new number 10: Adrian Mutu. The Romanian is notorious for his problems and they certainly don’t need documenting here, but Mutu’s quality is undeniable. His signing is a huge coup for a club of Cesena’s stature, and at 32 years of age Mutu should still have plenty to offer. Plying his trade with a small-town club away from the spotlight, Mutu won’t get a better chance to put his head down and enjoy the rest of his career. The Seahorses aren’t a big club by any stretch of the imagination. The last few decades have seen them spend more time in the lower tiers than Italian football’s upper echelon, and their Serie A return came after consecutive promotions from Lega Pro (2009) and Serie B (2010). Cesena’s longest stays in Serie A both lasted just four years (1973-77 and 1987-91) so on-paper it looks like they’re currently performing above their level. Currently, such an assumption is wholly inaccurate. They’ve added depth, experience and genuine quality to their squad this summer and are in an excellent position to establish themselves and challenge for a higher finish than last season’s 15th. They may be third favourites for relegation and there’s always the chance that Mutu’s demons will resurface, but for now they should be looking forwards, not over their shoulders. Unfortunately it won’t be an easy start for the Seahorses as they welcome Napoli to the Stadio Manuzzi this evening. Comfortably beaten 4-1 in the same fixture last season, new coach Marco Giampaolo will see tonight as a test of how far Cesena have come. Nobody can expect this side to gel immediately and it’ll take all of Cesena’s endeavour to contain Napoli’s strengthened squad, but the Partenopei have a midweek Champions League fixture with Manchester City to worry about. If Napoli’s focus isn’t completely on Cesena this week then there’s every chance the Seahorses and their new-look Eder-Mutu-Martinez frontline could do some damage. I’ll be watching tonight’s game on ESPN at 19:45. Further analysis will follow sometime this weekend.